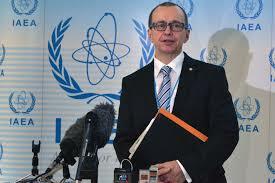 AP News 12/05/18: The U.N.’s nuclear watchdog says its top inspector has quit with immediate effect, just as the agency’s work in Iran is once again in focus. The International Atomic Energy Agency didn’t give a reason for the sudden resignation of Tero Varjoranta, stating Saturday that it doesn’t comment on confidential personnel matters. The move comes just days after U.S. President Donald Trump announced the United States would withdraw from the 2015 Iran nuclear accord designed to keep Tehran’s atomic weapons program in check. The significance of this resignation is historical. It is uncanny just how short the collective memory of political leaders and the mainstream media really is. Iraq was invaded in 2003 by America followed largely by an allied force whose membership was made up of the sycophantic, frightened or coerced. With Iran, like Iraq, there are some striking features that come from a well-used playbook and the resignation of the most senior weapons inspector to Iran confirms what America wants next. Like Iraq in 2003, Iran is now being propagandised as a foe with weapons of unimaginable destruction even though they don’t exist. Like Iraq, international weapons inspectors have continually countered the false claims of America that they exist. Like Iraq, America’s allies in Europe have continually supported those weapons inspectors as we have recently witnessed. Like Iraq, France and Germany have specifically warned America in no uncertain terms that inflaming Iran would ignite the Middle East into total chaos. Like Iraq, America is once again pursuing a policy of confrontation. Like Iraq, America has sought to discredit the same weapons inspection teams. Like Iraq, the most senior nuclear weapons inspector was forced to resign. And Like Iraq, just some of the individuals responsible for setting the Mid-East up in flames first time around was the fake news and propaganda fest created by Benjamin Netanyahu and John Bolton. It was unquestioningly swallowed whole by the Western media. Clearly, nothing has changed. Same two warmongers, same media. One year before the invasion of Iraq in 2003, the Israeli government was distrustful of America’s confrontational and aggressive stance. Today, the Israeli government is aggressively lobbying for exactly that – confrontation. Like today, in 2002, Netanyahu was at the centre of creating the invasion of a neighbour. Today, Israeli PM Benjamin Netanyahu says Israel has evidence Iranian officials were “brazenly lying” when they said Iran wasn’t pursuing nuclear weapons and that the Islamic republic is keeping an “atomic archive” at a secret compound. This is in total and repeated contradiction to the weapons and nuclear facility inspectors own reports, who are fully supported by the EU, Russia and China. Mohamed ElBaradei (image on the right) was the Director General of the International Atomic Energy Agency (IAEA), an intergovernmental organization under the auspices of the United Nations, from 1997 to 2009. He and the IAEA were jointly awarded the Nobel Peace Prize in 2005. ElBaradei learned that the Bush administration was trying to deny him a third term as head of the Agency in 2003. In its effort to find incriminating information, the United States even tapped ElBaradei’s phone. That effort’s ringleader was none other than – John Bolton. That visitor was – John Bolton. Tero Varjoranta is a Finnish diplomat who started working as Deputy Director General of the IAEA and Head of the agency’s Inspection and Supervision Department. He had 30 years experience in the industry. He stepped down three days after Donald Trump’s Iran withdrawal announcement. One wonders if Varjoranta has suffered a visit from Bolton too. “In these circumstances, we will not let a proposed resolution pass that would authorise the use of force,” said the joint statement. Much of that intelligence came from Israel’s Netanyahu. Two days later, America invaded Iraq. The pretext for war with Iran is coming – we just haven’t been told what it is yet – but it’s coming. Will the EU’s resolve stand firm this time around?